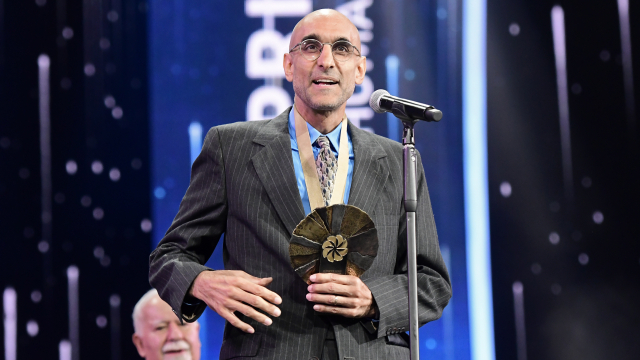 The $1.1 Million Aurora Prize for Awakening Humanity was awarded tonight to Dr. Tom Catena, a Catholic missionary from Amsterdam, New York who has saved thousands of lives as the sole doctor permanently based in Sudan’s war-ravaged Nuba Mountains. The Aurora Prize, granted by the Aurora Humanitarian Initiative on behalf of the survivors of the Armenian Genocide and in gratitude to their saviors, was announced at a ceremony in Yerevan, Armenia. He was selected as the 2017 Aurora Prize Laureate from more than 550 nominations submitted from 66 countries. For the last nine years, Dr. Catena – known by locals as “Dr. Tom” – has been on-call 24 hours a day, seven days a week at the Mother of Mercy Catholic Hospital to care for the more than 750,000 citizens of Nuba amidst ongoing civil war between the Government of Sudan and the Sudanese People’s Liberation Movement. Patients have been known to walk for up to seven days to receive treatment for injuries from bombing attacks, and ailments ranging from leprosy and tuberculosis, to bone fractures to malnourishment and malaria. It is estimated that Dr. Catena treats 500 patients per day and performs more than one thousand operations each year. Leading international humanitarian figures and Aurora Prize Selection Committee members, including Shirin Ebadi, Gareth Evans, Leymah Gbowee, Vartan Gregorian, Hina Jilani, and Ernesto Zedillo, were in attendance to celebrate the 2017 Aurora Prize Laureate. Guests of the Aurora Prize Ceremony also honored the exceptional contributions of the other four 2017 Aurora Prize finalists: Ms. Fartuun Adan and Ms. Ilwad Elman, the Founders of the Elman Peace and Human Rights Centre in Somalia; Ms. Jamila Afghani, the Chairperson of the Noor Educational and Capacity Development Organization in Afghanistan; Mr. Muhammad Darwish, a medical doctor at the Madaya Field Hospital in Syria; and Dr. Denis Mukwege, a gynecological surgeon and Founder of the Panzi Hospital in the Democratic Republic of Congo. The naming of the 2017 Aurora Prize Laureate follows the release of the Aurora Humanitarian Index, the second annual global public opinion survey that gauges attitudes towards humanitarian responsibility, the effectiveness of humanitarian intervention and individuals’ motivations to intervene on behalf of others. The Index found that support for humanitarian action is on a steep decline, and that a rise in populism around the world is affecting the public’s perception of efforts made to aid refugees around the world.